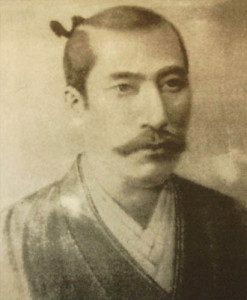 The warlord Oda Nobunaga (1534-1582) was extremely multi-dimensional despite his harsh reputation. This single figure in Japanese history laid the foundation stone for the centralization of Japan based on his tenacity, creativity, openness to new thought patterns – and understanding the real implication of his power mechanisms. Therefore, even in death, the trinity of Nobunaga, Toyotomi Hideyoshi, and Ieyasu Tokugawa would form a natural political legacy that ultimately led to a centralized state. However, despite the linkages of Nobunaga, Hideyoshi and Tokugawa the thought patterns were extremely different. Indeed, Tokugawa gained enormously from the deeds set in motion by Nobunaga and continued to a certain extent under Hideyoshi. Yet unlike Nobunaga, who was open to outside ideas and enormous innovation, the closure of Japan, on the whole, would be implemented by Tokugawa – and following leaders during the Tokugawa era of 1603-1868. Turning back to Nobunaga during his lifetime then a fascinating side to this remarkable individual can be witnessed by his love of the arts. This especially is highlighted by the relationship between Nobunaga and the influential artist Kano Eitoku (1543-1590). 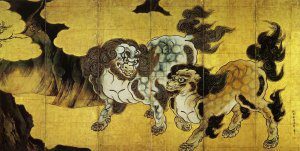 In the sixteenth century, Eitoku was one of the most prominent artists to emerge in this period of Japanese history. Yet his prominence was greatly shaped by Nobunaga because this innovative warlord understood the importance of culture. Also, true to the nature of Nobunaga then culture, just like religion and the political order, shouldn’t be shackled by the past. Therefore, Nobunaga and Eitoku developed a very intriguing relationship where art and power politics enabled this artist to reach out to the upper echelons of society. Unlike Nobunaga who rose to unimaginable power that was not foreseen during the early part of his life, the same didn’t apply to Eitoku in his area of influence. 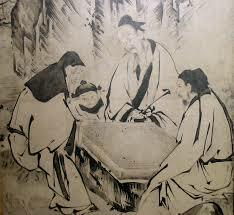 After all, Eitoku was the grandson of the famous Kano Motonobu (1476-1559) therefore many doors were open to him. However, Nobunaga would further open up new channels because of his patronage of Eitoku. Also, unlike certain stratification areas in relation to art Nobunaga had a liberalizing streak that engulfed many aspects of his thinking. The most poignant aspect of the relationship between Nobunaga and Eitoku is that high culture was important to this powerful warlord. Yet, high culture under Nobunaga didn’t apply to the abuse of power by several Buddhist orders. Therefore, Nobunaga and Hideyoshi were not afraid to tackle the heart of Buddhist power. Similarly, Hideyoshi learned from Nobunaga that attacking religious power mechanisms and the ruling order was sometimes essential in order to further centralization. Under Nobunaga many areas of liberalization in relation to Christianity, commerce, giving more rights to peasants, modernization of military arms, the arts – and other important areas – became standard under his rule. Yes, Nobunaga would crush alternative competing power mechanisms irrespective if Buddhist orders or other warlords. However, this was done based on natural progression. It is fitting that powerful artists like Eitoku flourished under the patronage of Nobunaga. Indeed, other artists outside the patronage of Nobunaga were equally elevated in this period of Japanese history.